Under Marxist theory, workers are being exploited for their labor and not receiving the full value of their labor. Workers however have a choice in who they work for and how much they earn so how can it be called exploitation? If it because they starve if they do not work, is this not falsified by welfare states, as well as being irrelevant since from what I understand, you still are forced to work if you wish to eat in socialist society, only you have even less say in how much you work for as it is dictated by socially necessary labor time, which is not determined by an individual. Workers however have a choice in who they work for how much they earn so how can it be called exploitation? We could address your question in two ways then. The first would be to say that one cannot freely choose to work for a given employer. Employers are the ones with the power to hire and fire, and in the current labour market, employers are significantly empowered to refuse to employ you. This is evidenced in the huge game of recruitment processes that goes on to give employers the means to choose between pools of candidates rather than relying on any available hands. The second would be to say that you may be able to choose between a number of possible options to work for, but all such options result in treating you (as the employee) unfairly, since employment by necessity wants to profit from the work you do at a rate above what it costs to pay you to do it. You don't have to work for any one person who is particularly unfair in their practices, but no matter who you do work for, they will always be driven to underpay you for work that's been well done. The headline Marxist answer is since all bosses - employers - exploit, the worker's only choice is which employer he will exploited by. There is no choice between exploitation and non-exploitation but only a choice of exploiter. 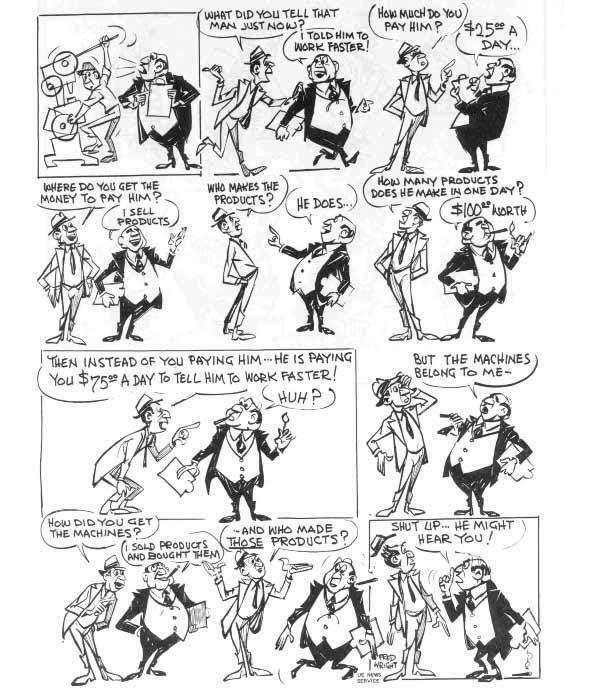 Exploitation is located in the gap between the value of what the worker produces and is paid for and what the worker produces and is not paid for. In a simple example, say a worker is paid $100 a day. In that time the worker produces goods or commodities which the employer - the capitalist - sells for $250. The worker is 'unpaid' for $150 of what s/her produces. The capitalist calls it profit - a kind of entitlement due for risking his or her capital in the firm's business - and the Marxist calls it exploitation since the worker is being swizzed out of $150. Depending on the level of employment and the state of the market, a worker may have some choice - usually does - in who to work for. Marx's point is that whoever the worker works for, s/he will be exploited in a capitalist economy because all capitalists extract surplus wage-labor and the worker must work for some capitalist or other or face unemployment and starvation (or more likely nowadays the relative poverty of state hand-outs). Hence Marx's reference to 'forced labor'. All this is only a skeletal account of Marx's complex narrative of exploitation. Moreover, I have simply given the kind of account a Marxist could give in reply to your question. My own views about Marx are nothing to the point. K Marx, Wages, Price and Profit (1865, published 1898), V - XII. K. Marx, Capital, 1867, I, Part 3, Ch. 9, §1 et passim. If you want a modern interpretation, it's the reduction in labor share (in relation to capital share) in production/income that's the "exploitation" aspect. If you have less bargaining power (because your contribution matters less), then you're more easily exploited. The stability of the labor share of income is a key foundation in macroeconomic models. 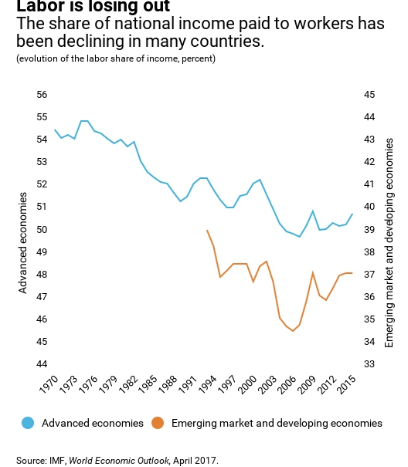 We document, however, that the global labor share has significantly declined since the early 1980s, with the decline occurring within the large majority of countries and industries. We show that the decrease in the relative price of investment goods, often attributed to advances in information technology and the computer age, induced firms to shift away from labor and toward capital. Marx believed wages to be merely at a subsistence level of the workers and that at all times the supply of workers outnumbered the demand at the given wage level. [...] From Marx’s theory it follows that the labor share is falling over time. As wages remain at the subsistence level, output increases through increasing usage of capital per worker. Only if the workers would gain bargaining power, their wages could improve. If these would improve at the same rate as output per worker increases, this would lead at most to a constant share. Marx is blamed (as your question does to some extent) for not anticipating the rise of the welfare state, althogh not even pensions were commonly accessible in his time, because the retirement age was usually too high compared to life expectancy back then (e.g. 70 vs 45 in Prussia in 1889 or 70 vs 50 in the UK in 1908). Also Marx failed to anticipate the rise of the middle class, but whether that's a stable long-term trend... is another matter. Still, the rehabilitation ought not to go too far. Marx’s errors far outnumbered his insights. His insistence that capitalism drives workers’ living standards to subsistence level is absurd. The genius of capitalism is that it relentlessly reduces the price of regular consumer items: today’s workers have easy access to goods once considered the luxuries of monarchs. The World Bank calculates that the number of people in “extreme poverty” has declined from 1.85bn in 1990 to 767m in 2013, a figure that puts the regrettable stagnation of living standards for Western workers in perspective. Because the choice is meaningless. Ironically, a good example of a meaningless choice are elections in the former communist countries. On paper, you had a choice of parties that you could pick from. On paper, they even had different policies and ideas. In practice, they would all form an electoral block and they would all subscribe to the basic principles of communism (a condition for being allowed to exist as a political party at all). So no matter what you voted for, you would end up with the same result. And anyone the primary communist party would get 99% of the votes so changing your vote, even convincing all your friends and neighbours, would not change anything. The choice of employers is likewise meaningless if the exploitation of workers is not part of an individuals style of doing business, but of the system that they all belong to. Under Marxist theory, exploitation of workers is not the result of one evil boss, but of a system that rewards such behaviour. For example, a company that does not exploit its workers would be outcompeted by a company that does. We can actually see this happening in the real world, whenever a company is in trouble you are guaranteed to see discussions about reducing personnel costs. In the specific situation this is usually done by reducing the number of workers, but in the long run it is accomplished by paying as little wages as the labor market lets you get away with. workers are being exploited for their labor and not receiving the full value of their labor. From the above it follows that under the condition that employers can pressure workers to work for a salary that does not express the full value of their work, they will. And according to Marxist theory, they can, because they hold the means of production. In the real world, unemployment appears to be the more immediate factor. At least in the countries I have seen up close, it is high unemployment that leads to lower salaries, reductions in workers rights, cuts into pensions and health care, etc. The origin of the problem is the ownership of the means of production by the capitalist (together with a legal system that recognises such ownership via property rights and means of enforcing those rights like police, judges, etc). It does not matter that a worker can choose or not. Exploitation exists in monopsonistic, oligopsonistic, and competitive labour markets. 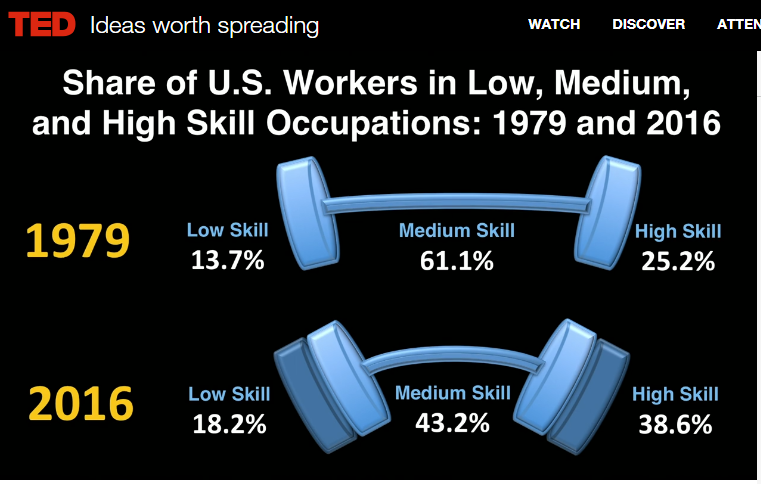 It even exists in markets where there are not enough workers to fill a vacancy. All that matters is that the workers do not own the capital they use to produce. It is the capitalist who has the de jure and de facto right to distribute the value produced by workers. He will do so in a way that maximises his profits, paying the least of wages possible, sufficient to keep workers alive (in the Ricardo/Marx version), or willing to work for him (the market wage, in the mainstream economics' terminology). Because the core of the problem is the ownership of the means of production by one group of people and not another, Marx suggested that the solution is the common ownership of those means of production. This way, no group could exploit each other. Welfare states did not exist in the same way in 1800s when Marx lived. Many of the current welfare states became welfare states after decades of social democratic politics. For example 12 or 14 hour work days (or even longer) were common in his days. And horrible working conditions. People died like flies in factories. It took like 100 years of political struggle (or something) to reduce it to 8 hour work day and laws which made employer liable for workplace damage and such things. It is clear to me that a definition of what is meant by "exploitation" is required to give a plausible answer. Being paid less than what I think my labor is currently worth. With this definition, it is clear that "exploitation" has nothing to do with having a "choice of working boss." If my current boss is paying me less than what I think my labor is worth, I will feel exploited. Also, not providing a safe and healthy working environment (to increase profits), would be another form of exploitation. Not providing rest breaks and sick time off, would be exploitation as well. So, it should be clear that there are several forms of labor exploitation, independent of whether one has a choice of working boss - or not. The central thesis of exploitation and lack of freedom to choose one's employer centers on the fact that working conditions were fundamentally unfair. Marxism is a deeply controversial paradigm and will provoke all manner of strong reactions from people; never forget that Karl Marx advocated for armed revolution, this, thus makes him controversial. Killing people is a very strong stance. Eduard Bernstein, a commentator and critic on Marxism, argued that the workers' conditions were improving and rights would be gradually won through discourse. He stated this ran contrary to Karl Marx's predictions, and this thus proved that traditional Marxism had flaws. Modern critics; belonging to the soft-left; cite the advent of universal healthcare, shorter working hours, even the appearance of smart phones, etc. ; and the like, as evidence that Bernstein's claims had at least some merit. The counter-arguments from the hard-left was that the environmental situation is worsening, statistics were being manipulated to show improvement in the workers' conditions, militiary powers were becoming more deeply entrenched; etc. The soft-left claim that workers do indeed have some control over their choice of employer and would gain even more control over time from the social democratic movement. The hard-left dispute the previous sentence, to varying degrees. Because in Marxist theory, things like factories, machinery, infrastructure just grows out of the ground like trees or falls from the sky like rain. According to Marx, you, the worker, are exploited because the "capitalists" (the business owners) are paying you less than what they make from your labour. The problem with this is that it completely ignores that the "capitalists" are the ones who shell out the money for the material assets that the company needs to come into existence, and with that, they take a huge risk of loosing that money (The vast majority of businesses that are started end up failing). It also ignores the fact, that even if you have the money on hand, starting and running a company is a LOT of work in and of itself. The money that capitalists take as their cut, goes in part to fund the further existence and operation of the company, and in part as their own "salary": to recoup the money they invested and, when that's done, to turn a profit, as in, to actually get something out of the whole ordeal of coming up with the cash, taking a huge risk in investing it and doing the work needed to start and run the company. Marx ignores all of this. Not the answer you're looking for? Browse other questions tagged marxism or ask your own question. Are there philosophers working with the idea of language being ideological?